As I draft this I am in the middle of sharing festive related posts and it will be after Christmas before I will manage to share this card which was amongst a few in a feature article, in the Oct/Nov/Dec issue of The Stampers’ Sampler, of cards which all featured Darkroom Door butterflies, from the beautiful stamp set, Butterfly. I don’t know how many of the cards I will end up sharing with you but for this post, here is one card which I gave the title of The Lone Butterfly. 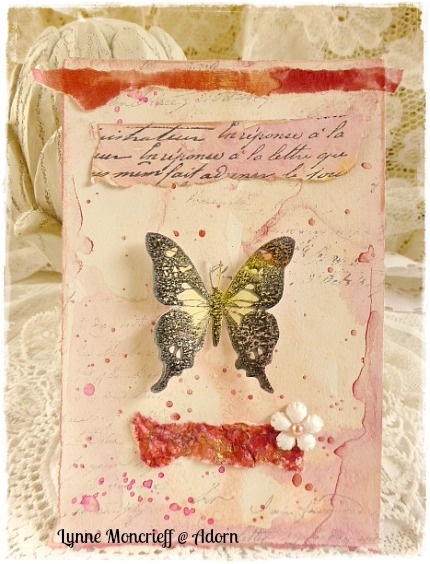 I wanted the butterfly to be raised from the cardbase, giving the impression that it has alighted there merely for a second before it takes flight on the summer’s breeze. A fragment of found paper which had several colours applied and if I remember, different paints. I liked the way that there are veins of gold appearing on the paper. Lots of paint splatters, am I at my happiest when creating splatters! There is something about creating splatters which is so childlike, maybe it is the way it is done with abandon, a very carefree way to apply paint. What is missing from the photographs is the shimmer created by the Twinkling H20s which you can almost pick up from the close-up of the painted fragment of paper. The colours on this card are far removed from the colours viewed from our windows at this time of the year but one thing is for certain, it might well be December but in no time at all, we will be in the summer months of 2015 wondering where the past six months have disappeared to and why time is passing us by so quickly! I wanted to bring your attention to details of the Darkroom Door 2015 Artist Trading Card Swap. For each month of next year (excluding the month of December), there will be a swap and what a great range of themes there are. You can pick a theme you particularly like or why not take part, each and every month! 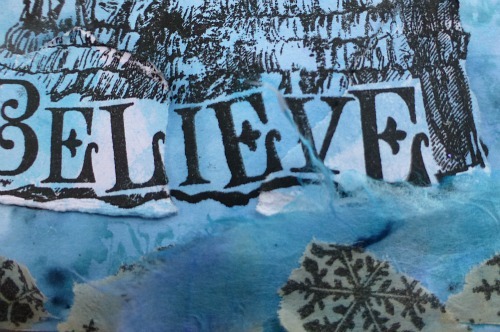 Visit the Darkroom Door blog (link at top of post) for all the details of themes and where to mail your ATCs. Sending SEASONS WISHES to each and every one of you Thank You for your friendship, support and encouragement those past 12 months and for your never ending inspiration which you share on your own blogs. I send my wishes to all of you that the festivities are a time of warmth when you can create new traditions and memories but at the same time, it can be a difficult time of the year. Here’s to joy and contentment for all of you. I have so many to thank for making this past year a remarkable one for me, it has been beyond my dreams. and to Stampington & co – it was an honour to be a Guest Artist for The Stampers’ Sampler and then to finish the year as a Guest Artist at their Somerset Place Blog – no wonder I am black and blue from pinching myself so much!!! Each time I am published in one of their magazines, alongside artists I respect, it makes me wonder how I ever got to be there. I am writing this as though it is my final post for 2014 but don’t be surprised if I pop up again with a post here and there. With only this left to say for the moment …. 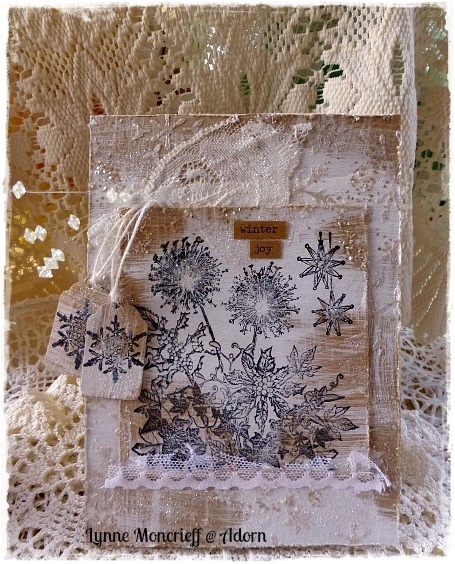 I want to share with you a beautiful card I received some weeks ago from the lovely Diane. 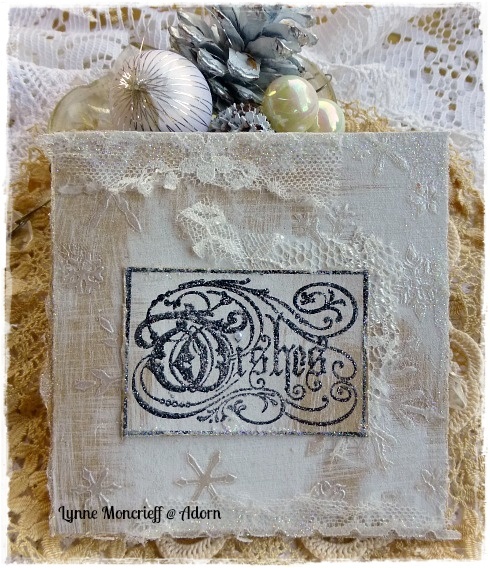 Diane always creates the prettiest of cards and always takes the trouble to create a matching envelope liner. I also have to say Thank You to Diane for the wonderful stencils she cut for me. Over at the That’s Crafty Blog I am sharing my final project for 2014 as the next time I appear over there it will be 2015! To view the complete project please visit HERE. It isn’t the last of my own blog posts as I have some blog posts drafted which I will try and squeeze in between now and the 25th and also between the 25th and the New Year. 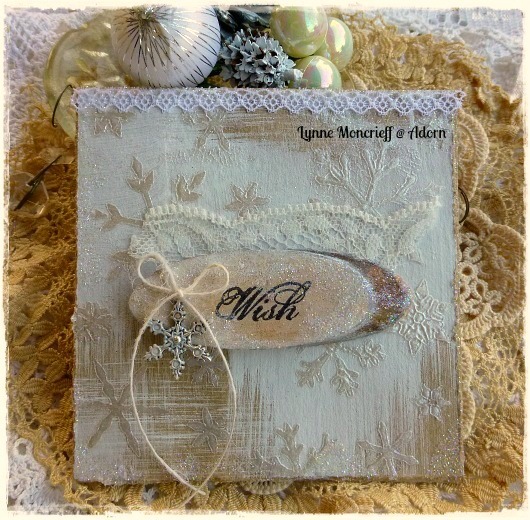 The cards I am sharing in this post were all essentially made in the same way, with the Wishes stamp as the focal on each card. I might have dabbled with quite a bit of red paint recently but I was happy to return to soothing neutrals! A little variation in the form of a charm. One of my favourite products for Christmas cards (and beyond) this year, has been Maimeri Iridescent Paste (available from That’s Crafty). A gorgeous product to use because it gives a beautiful shimmer, look at the photograph below which I angled to allow daylight to catch the snowflakes stencilled onto the background. I have been using it with this lovely snowflake stencil. I have even used it on fabric although I wouldn’t recommend using it on fabric which will be washed, what I used it for is purely ornamental. There is no reason this stamp couldn’t be used to send Birthday Wishes or Good Luck Wishes, I just happened to like it as a message for Wishes of the Season and many of you will know that Wishes is the word I use whenever I send an e-mail, card or when commenting during a blog visit. As always, thank you for taking the time to visit here. I have another card to share which features another one of the newly released Crafty Individuals stamps, Winter Garden, CI-425. 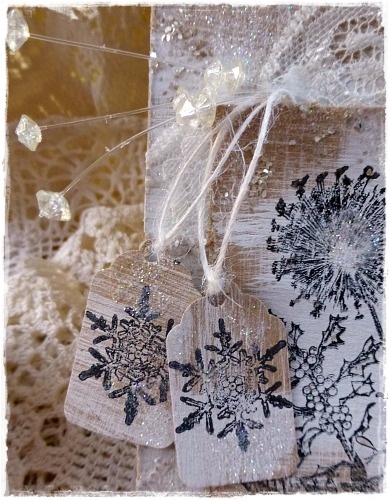 A very neutral colour palette with a hint of Kraft shining through and once again, that background with the snowflake stencil used with the fabulous Maimeri Iridescent Paste (available from That’s Crafty) which catches the light beautifully. This year I’ve used this on many of my cards as a stamping surface. I like the rough brushstrokes against the kraft. Lots of sparkle. 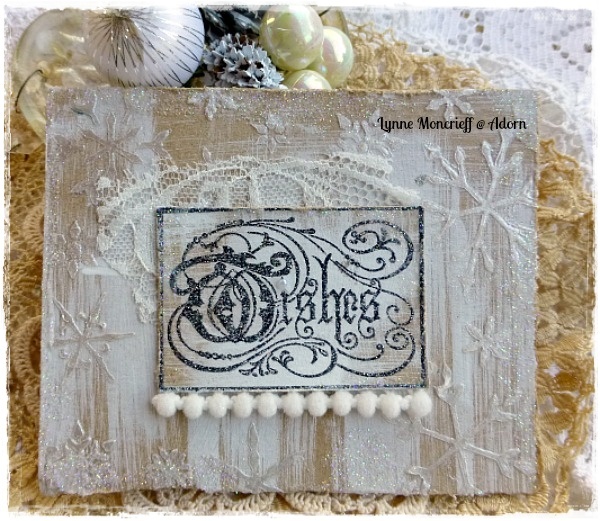 This snowflake stamp is also from Crafty Individuals, such a pretty snowflake. It was one of their stamps from a sample pack from some time ago. A very quick post but I am conscious of your time and that at this time of the year you don’t really have the time to linger over lengthy blog posts. Always so grateful of your visits. Light, Darkness – A Book @ That’s Crafty! The Heart Of It @ That’s Crafty!